Just in case it had slipped our mind(s), AT&T today let us know that both the Samsung Focus and HTC Surround will be available starting on November 8th. The LG Quantum will be available shortly thereafter. Both the Focus and Surround will retail for $199.99 after a 2-year agreement. Full presser after the break. * BlackBerry® Torch™ 9800 available in red and white on Nov. 7. 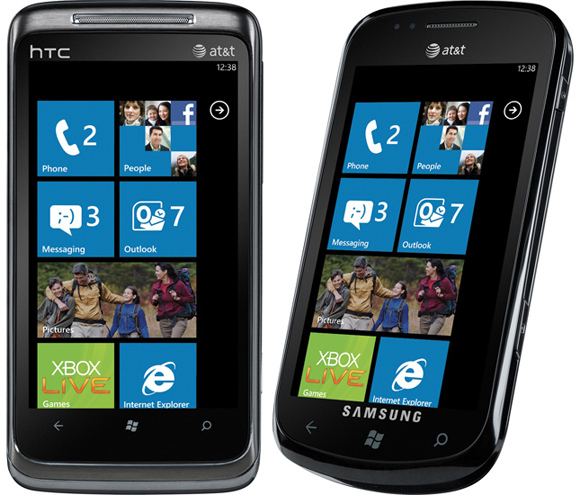 * New Windows Phone 7 devices from HTC and Samsung will be available in AT&T company-owned retail stores nationwide and online for $199.99 on Nov. 8 with the LG Quantum arriving in the following days. * Lineup of netbooks and notebooks available now with AT&T’s pay-as-you-go data service. * Beginning Nov. 7, customers can purchase any two accessories and receive a third one free. * Customers that purchase a qualifying U-verse bundle at AT&T stores can, with an agreement to a two-year term, receive an instant $250 in-store credit to use toward a new smartphone, other AT&T wireless device or accessory(s) – starting in select cities Nov. 7. AT&T* today announced the exclusive availability of new red and white versions of the BlackBerry® Torch™ 9800 smartphone – just in time for the holiday shopping season. With the arrival of three Windows Phone 7 devices in November, hot accessories, and special deals and holiday apps for AT&T U-verse® TV, AT&T is sure to have something for everyone on your holiday shopping list. Adding to the appeal of the best BlackBerry® ever, AT&T will offer two new red and white color variants for the BlackBerry® Torch™ 9800, both exclusive to AT&T customers and in stores beginning November 7. In addition, new Windows Phones from HTC, LG and Samsung, based on Windows Phone 7, will be available in AT&T company-owned retail stores nationwide and online for $199.99. The Samsung Focus™ and HTC Surround will be available on November 8 and the LG Quantum will be available in the following days. Holiday shoppers can also check out AT&T’s full lineup of netbooks and notebooks available online through AT&T’s new Mobile Broadband Center. The latest devices include the Acer Aspire AS1830 Notebook and the Dell Inspiron Mini 10 HD netbook which are also available at AT&T’s more than 2,200 company-owned retail stores. As an added value, AT&T offers the AT&T DataConnect Pass – the pay-as-you-need it data service that does not require a long-term contract to access the nation’s fastest mobile broadband network. Shoppers who are nervous about making mobile phone purchasing decisions for others can pick up the perfect stocking stuffers and maybe even earn a holiday treat for themselves. Beginning Nov. 7 through the end of the holiday shopping season, customers can purchase any two accessories and receive a third one of equal or lesser value for free. From new options like an iHome Mini Stereo Speaker System to limited edition holiday skins on cases from ZAGG, AT&T accessories are sure to be a featured item in stockings everywhere.